The white flowers appear in late April to early May. The sepals and inflorescence branches are bright red. Rackensack Wash, New River Mts., Maricopa Co., Arizona. 29 April 2018. TREE: A medium sized tree with sometimes multiple stems from the root crown, i.e. it can resemble a large shrub. Branches are often twisted and have colorful, scaly bark. 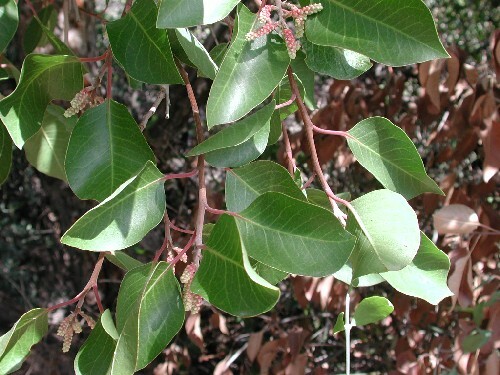 LEAVES: Dark green, shiny leaves are large by desert tree standards. Twigs and leaves are strongly aromatic when crushed. During rapid growth periods the terpene aroma may be detected a considerable distance from the plant. RANGE: Upper Sonoran Desert particularly where it merges into Interior Chaparral vegetation type. Fairly common in central Arizona. With a bit of irrigation this beautiful tree makes a wonderful addition to a xeriscape and does well in Phoenix and Tucson, Arizona. 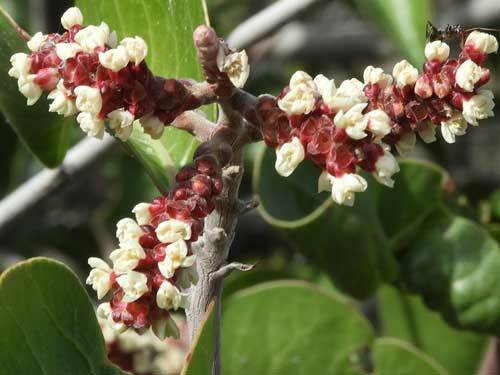 FLOWERS/FRUIT: Flower buds and young sprigs of berries are sumac-red and are borne in abbreviated panicles. 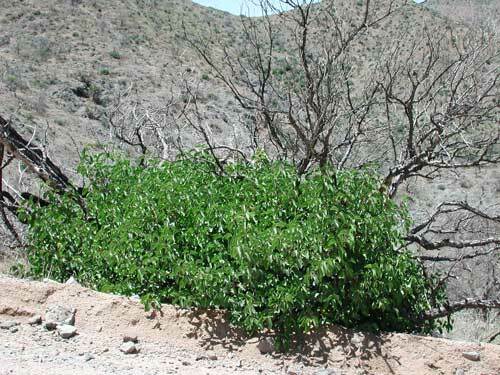 Sugar Berry (Rhus ovata) quickly re-establishes after fire from underground roots. Photo taken along Rackensack Canyon, Maricopa County, USA, in May 2008 three years after the fire.